When planning the outdoor living area part of the landscaping of your Atlanta home, is having an outdoor fireplace as the main focal point something that you have in mind? Hutcheson Horticultural is the perfect partner to help you realize this dream. You may be having trouble though, deciding between having an outdoor fireplace or a fire pit. Both of these items provide additional enjoyment of an outdoor living area by providing warmth, light, relaxation, and a visual focal point. However, they each have their distinct differences that should be taken in to account. How many people would you like your outdoor fire feature to accommodate? An outdoor fireplace is perfect for just a few people. It provides romantic ambiance and encourages intimate conversation. A fire pit is best for entertaining large groups of people as it provides 360 degrees of enjoyment and creates a more casual campfire like environment. A fire pit is low to the ground, and won’t draw away from an amazing view. Position the fire pit in a place where the view can be enjoyed. A fireplace has height and mass, and will become a focal point in your space. Decorative elements such as a hearth and mantel can be added. A fireplace is enclosed, making it easy to light even in windy conditions. Additionally, a fireplace can serve as a wind break that will protect guests. A fire pit is open and the flames can be more easily enjoyed. However, it will be difficult to light and enjoy in windy conditions. Additional factors to think about are, if you would like a wood burning or gas powered installation and what materials you would like to use, stone, brick or even concrete are all popular materials. The advantage of using a professional landscaping company, like Hutcheson Horticultural is that we can walk you through all these decisions during the planning phase of your outdoor living area. 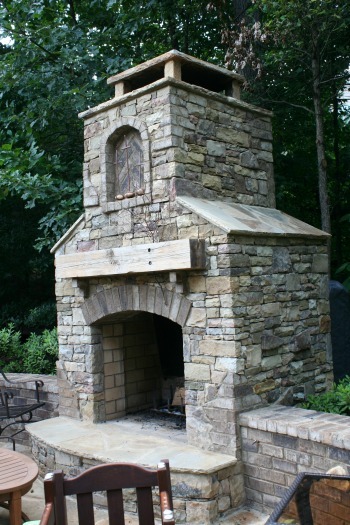 To schedule an appointment with one of our landscape design professionals to discuss your dreams for an outdoor fireplace or any other landscaping enhancement including pools and waterfalls, call us at 770-924-1001 or use the “Schedule a Consultation” feature on our website.